First, I have to give huge thanks out to Kelly, Riley, Reece, Dad, and Gordo, for spending 30+ hours allowing me to achieve my goal of running (finishing!) Leadville. Without them, it would not have been nearly as fun and perhaps not possible. 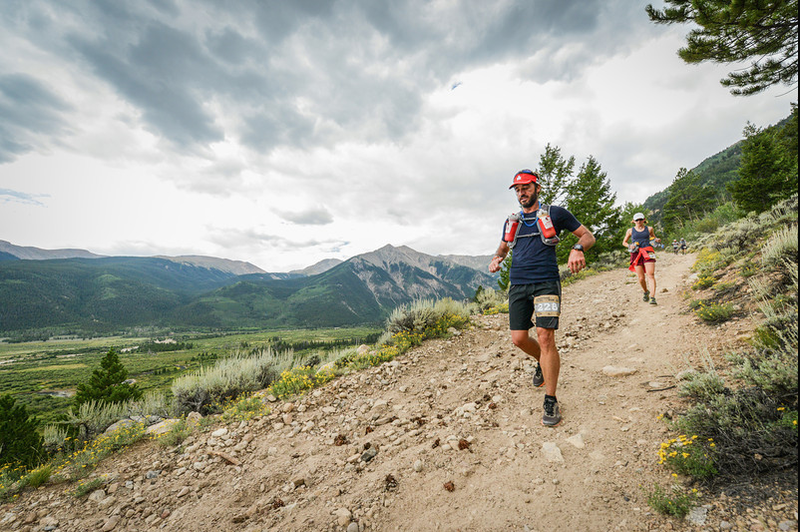 (I would have had to run unsupported using drop bags with no pacers…) And not just 30 hours, but the time surrounding the time in Leadville too. Pb in the future – breaking 25 hours? Training – not sure I could find more time to run, or if I’d want to. But all I did the last 6 months was run. I had a few 60 mile weeks, which is not a lot for ultra runners, but is a lot for me! No weight lifting, no biking, etc. Lots more work on the legs — lunges, squats, etc., would have helped. More downhill running would help (my legs were shaking coming into TL1 at 40 miles, and the 2nd climb up Hope on the return took a lot out of me…) Here are my weekly running miles the weeks leading into Pb… The 65 in week 18 was the week of the NF50 in NY and the 96 on week 22 was the week of the 24 hour where I ran 87 (and stopped just over 19 hours in, in order to be able to continue Pb training…). Acclimating — more time at elevation would also help, but again, not sure I could find the time. I spent 7 days in June in the NC mountains at 4500 feet, another 10 days in late July at the same place, and arrived in Highlands Ranch (6100′) on 8/5. We then went to Twin Lakes (9200′) on 8/13. Training was a bit limited those last 12 days as I needed to taper, and it takes a lot longer to recover at altitude. I did get a couple of 60-90 minute hike/runs in at 7500-8500 the 1st week, as well as two 14’ers. But I think that was about all my body could handle. Shoes – Suacony Virrata (road shoe) the 1st 40, Alta superior the next 20, Hoka Stinson the last 40. This was all fine. My feet were about done in the road shoe around mile 38-39, and I was ready for the Stinson at mile 50 but my crew was not able to get into Winfield (assuming Gordo would have carried another shoe across Hope for the river crossing). But this was all fine. The only thing I might consider in the future is to *start* in the Hoka, but I’d still change shoes at TL1 and TL2 to ensure dry shoes the rest of the race. Nutrition – base of vfuel and diluted grape juice (1/3 juice, 2/3 water). Mixed in some perpetuem. The hard boiled eggs and nut butters, while they worked in training, were not great in Pb. I think it was the fact that the 1st hard boiled egg I almost choked on, and the 1st nut butter I had was plain almond butter and was very dry. The almond butter + honey, or the hazelnut + chocolate, worked better. I also used the broths and noodles at the aid stations, ate some ptotatoe chips here and there, a couple of small boiled potatoes, half a hamburger at inbound/hatchery, etc. Nutrition was pretty good throughout the race — there were times I just didn’t want to eat, mostly on the climbs up Hope and Powerline, but I was always able to force a vfuel down and those seem to sit very well in my stomach. Nothing really jumps out as not working. Even the wood sticks I picked up to help me over Hope Pass were mostly ok, though I’d consider trekking poles in the future, at least for the big climbs. That’s a great pic. Not familiar with vfuel, will check it out. First I heard of Hokas was Kelly’s earlier post. As to training, in place of added mileage (i.e. more time spent training instead of with family), perhaps more intensity in some shorter efforts? Perhaps find some training runs where family can cycle or skooter with you for portions of it? Congratulations, Sean!